YAY. The "see what you missed" video of the Book Launch Party for Tamsen Fadal's latest book, THE NEW SINGLE, is up and running on YouTube. Enjoy and share with your fellow FB friends, networks and other social media. 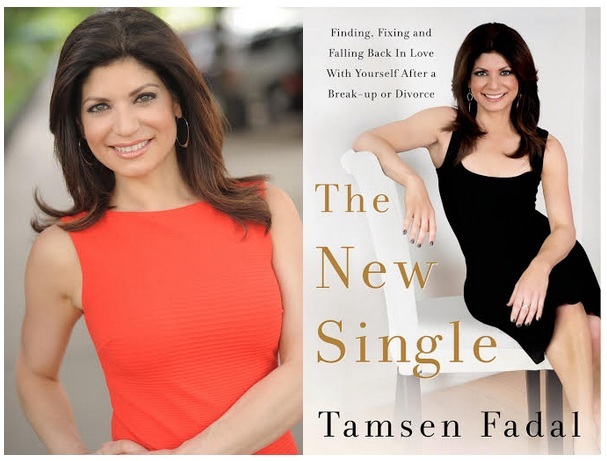 Tamsen Fadal, producer, author and ​seven-time Emmy®-winning Anchor, PIX 11 News has launched her latest book "THE NEW SINGLE: Finding, Fixing & Falling Back In Love With Yourself." The launch party, held on Tuesday, June 2nd, is at NYC's URBO located in the heart of Times Square. Event coverage photos are posted on Facebook, click here and enjoy! In "The New Single," Fadal shares her experiences and advice for finding, fixing and falling back in love with yourself and aims to empower women all over the country. No stranger to love and dating books, she has already authored 2 previous books on dating and love. Based on her very own steps she took to get herself back after her publicized divorce, "The New Single" explains the importance of finding those small, simple things in life that really matter including loving yourself first. Fadal wrote this book to share what has helped her fall back in love with herself, heal as a person but especially to help others going through the same experiences. The first 90 days after a split or divorce are so crucial because you are still in pain and not over it -- Fadal believes you are so "raw after a break-up because you don't know what to do ..." "The New Single" is an excellent roadmap for anyone needing to bounce back after a break-up or divorce. “The New Single,” is not just about, dating and relationships or divorce and break-ups. It is more of a self-help guide on how to avoid toxic, repetitive relationship patterns that hold you back combined with Tamsen's real life lessons-learned as well as stories from other women in similar situations. Also included are meaningful tips for moving forward and getting that much needed confidence and feeling of empowerment back. It's exciting and inspiring to cover this event and interview guests on the red carpet at URBO (located in the heart of NYC's Theater District), and to celebrate Fadal's latest book, "The New Single," among many fellow fans, friends and familiar faces. YAY, the event coverage photos have been posted on Facebook. Also be on the lookout for the "see what you missed" video which will be posted onto the Examiner.com article and this AllThingsDigitalMarketing blog post. So please visit frequently and stay tuned for more. ◊Tamsen Fadal, seven-time Emmy®-winning Anchor, PIX 11 News at 5:00 p.m., 6:00 p.m. and 10:00 p.m. & Author of THE NEW SINGLE: Finding, Fixing & Falling Back In Love With Yourself. ◊Dorinda Medley, “Real Housewives of New York. ◊Shannon Elizabeth, film & television star of “Dancing with the Stars” and “American Pie” fame. ◊Tommy Tune, nine-time Tony®-winning Broadway, film and television star, choreographer, dancer, theatre director and producer. ◊Andrea McArdle, Tony®-nominated singer/actress, Broadway's original Annie. ◊John Muller, Emmy®-winning WPIX-TV Anchor 5, 6 and 10pm news. ◊Scott Stanford, Five-time Emmy®-winning Lead Sports Anchor, PIX 11 Sports Desk & Host, WWE. ◊Mr. G, WPIX-TV Meterologist 5, 6 and 10pm news. ◊Frances Rivera, Co-Anchor, MSNBC Live with Thomas Roberts. ◊Maurice DuBois, five-time Emmy®-winning Anchor, WCBS News & CBS News. ◊Liza Huber, former star of Passions, Founder & CEO, Sage Spoonfuls. ◊Donna Hanover, former First Lady of New York City, author, television personality, and Honorary Co-Chair of Women Who Care. ◊Kathy Wakile, author of national best seller, Indulge, of “Real Housewives of New Jersey” fame. ◊Tim Morehouse, U.S. Olympic Silver Medalist; Founder & CEO, Fencing in the Schools; Goodwill Ambassador, Special Olympics World Games. ◊Rita Cosby, Three-time Emmy® winning Special Correspondent, Inside Edition and Host, WABC Radio & best selling author. ◊Rich Graziano, President & General Manager, WPIX –TV. ◊Kaity Tong, WPIX-TV Weekend Anchor. ◊Diana Falzone, FOX News Correspondent. ◊Jill Nicolini, WCBS -TV Entertainment Reporter. ◊Felicia Finley - Broadway star of Mamma Mia! & The Wedding Singer. ◊Teresa Priolo, Reporter, Fox 5 News & Good Day New York. ◊Vikki Ziegler, Host of Bravo's Untying The Knot, Celebrity Divorce Attorney. ◊Chuck Nice, Comedian, television and radio personality, Host, Top 10 Countdown and HGTV’s Buy Like a Mega-Millionaire. ◊Rob Shuter, Host of VH1's The Gossip Table. ◊Shamina Rai, Correspondent for ZEE TV. ◊Peter Shankman, entrepreneur, marketer, investor, blogger, Co-Founder of Shankman/Honig & creator of the HARO Project. ◊Melanie Notkin, best-selling author of Otherhood. ◊Cooper Lawrence, Radio Host & Best Selling Author. ◊Milly Almodovar Thompson, Senior Beauty Editor, Cosmo For Latinas. To purchase "The New Single" on amazon click here. Please share this on your LinkedIn, Facebook, Twitter, and other social media networks you enjoy! Thanks for visiting. Photo of Tamsen Fadal and book cover courtesy of James Grant PR. Nice setup with really a classy look. Some time ago I was looking for such an event too, which will be in my budget and the one that is appreciated by all. During my search I found the best dance club nyc and got fully satisfied and I am very much impressed by their settings and helping environment.